ROXBURY – As Wayne Valley heavyweight Jordan Botero warmed up with the rest of his team he glanced up at the scoreboard when the enormity of the North 1, Group 4 section final against Roxbury and his place in it was instantly realized. The match was starting at 106 pounds, the lowest weight class, meaning that Botero’s would be the last bout of the evening. Trailing the entire match, the Indians hung tough and trimmed the lead down to two points. Facing a tough competitor, Roxbury’s Charles Lisa, Botero took the mat with the outcome hanging in the balance. Brute strength was on full display as neither Botero or Lisa would give an inch in a match that went through three periods, a one-minute overtime, two 30-second rideout periods, and into an ultimate tiebreaker to decide a victor. Botero escaped with 2.8 left in the ultimate tiebreaker to give Wayne Valley its only lead of the night, but the most important one. His win in the final match clinched a 33-31 victory over the top-seeded Gaels for the Indians’ second section title in school history on Friday night at Roxbury High School. “I’m so happy for Jordan coming up clutch at the end but this was absolutely a total team effort,” said Wayne Valley head coach Todd Schroeder. Reid Colella’s pin at 170 pounds was his 100th win in his Wayne Valley career. In front of a jam-packed crowd, Roxbury got off to a hot start at the lower weights. Franco Mazza started the night off with a pin at 106. Thomas Conselyea followed with a major decision and Alex Silva’s 28-second pin put Roxbury in front 16-0. It looked like that lead might grow when Ryan Hammer was nearly put to his back in the first period. However, the Indians have been resilient all season. They were once again in this match starting with Hammer’s come-from-behind 6-4 decision to get Wayne Valley going. Sean Hammer and Elijah Lugo followed with wins by decision before the swing match at 145 gave Wayne Valley the jolt it needed. Down 4-3 toward the end of the second period, Matt Jiminez caught Alex Poissant and turned him for a pin that cut the lead to one, 16-15. Roxbury bumped the lead back up to 10 on a pin by Evan Vazquez at 160 but the meat of the Indians’ lineup was still on deck. Reid Colella’s first-period pin at 170 gave him 100 wins for his career. Jordan Botero won in dramatic fashion in the final match of the night to give Wayne Valley the section title. The Indians were still down 10 heading into the final three bouts knowing that they needed to win all three to grab a section title and pick up some bonus points along the way. Dan Murphy got things started at 195 pounds with three back points early in the third period that proved to be the difference in an 11-9 win over Ben Temples, who was 26-4 coming into the match. 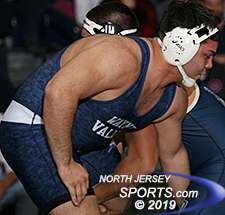 The necessary bonus points came courtesy of Nick Trani’s second-period pin at 220 to set the stage for Botero with Wayne Valley trailing by a point, 31-30. 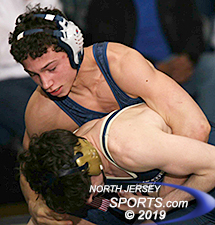 The crowd was buzzing throughout the match and that reached a fever pitch with the last match of the night deciding which team would win a section title and head down to Toms River on Saturday. After a scoreless first period, Botero started in the down position and quickly scored on a reversal to take a 2-0 lead. Lisa answered with an escape and added another escape when Wayne Valley head coach Todd Schroeder elected to have Botero to go neutral to start the third period. Neither wrestler took any shots in the third as intensity picked up in the Roxbury gymnasium and the match head towards overtime. Botero nearly had a takedown but time ran out as the wrestler went to rideout time. Botero quickly escaped in his 30-second session before starting neutral once again during Lisa’s turn to start down with the wrestlers tied at 3 needing an ultimate tiebreaker for a winner and a champion to emerge. Lisa looked to be in control as he had Botero’s leg up in the air. As Botero hopped around with the final seconds winding down he was able to twist and wiggle free for the escape with just 2.8 seconds left as his teammates, along with the coaching staff and faithful fans of Wayne Valley, stormed the mat to celebrate an exhilarating run to becoming North 1, Group 4 section champs. Wayne Valley (18-4) is currently riding an eight-match win streak heading into the Group 4 semifinals on Saturday at the RWJ Arena in Toms River. There they will get either Phillipsburg, Jackson Memorial, or Kingsway, three powerhouse programs in New Jersey, in the Group 4 semifinals. But with a section title in hand and nothing to lose, the Indians will look to make another statement and show that they are making their way towards the upper echelon of wrestling programs in New Jersey.